Andrew Lloyd Webber’s The Wizard of Oz offers Adelaide audiences a nostalgic trip down the yellow brick road. It’s unsurprising that the storyline and messages of The Wizard of Oz have dated. These days, a teenage girl would be much more reluctant to head into the unknown with so many strange males. Watching the show as an adult, the characters – Dorothy, in particular – seem two-dimensional and the Wicked Witch of the West not quite so menacing. But this Andrew Lloyd Webber production is a family show that doesn’t seek to put too much of a spin on the classic storyline, instead relying largely on its audience’s love of the original characters. The Wizard of Oz features the music of the Oscar-winning score of the original 1939 film – including a faithful version of “Over the Rainbow” – augmented by some new songs from Lloyd Webber and Tim Rice. Relative newcomer Samantha Dodemaide has stepped into Dorothy’s ruby slippers, with the talented cast also including musical theatre veteran Anthony Warlow (as the Wizard and Professor Marvel), Lucy Durack (Glinda the Good Witch, whom she also played in Wicked), and Jemma Rix (the Wicked Witch of the West). One-line jokes and witty punchlines are traded on stage, and a few clever cultural references get the audience laughing. A highlight is Eli Cooper as Scarecrow, flopping around as if he’s truly made of straw and delivering his dialogue with perfect comedic timing. Scarecrow, of course, is at his best within the ensemble of Dorothy and her friends, including the Tin Man (Alex Rathgeber) and the cowardly Lion (John Xintavelonis). But they’re all upstaged by Toto, played by identical terriers and theatre debutants Flick and Trouble, whose occasional nose lick for Dorothy cements their on-stage chemistry. The costumes are also noteworthy – particularly the Wicked Witch’s monkeys – and the ensemble dances are great fun. Projections add to the drama in several scenes, including the tornado and when Dorothy is snatched into the air by flying monkeys. While the beginning of the show is slow, with an extra scene delaying Dorothy’s arrival in Oz, the second half is jam-packed with action and excitement, and the Wizard’s unveiling is a wonderfully crafted moment of humour and drama. The Wizard of Oz may not surprise, but it clearly delighted the opening night audience. 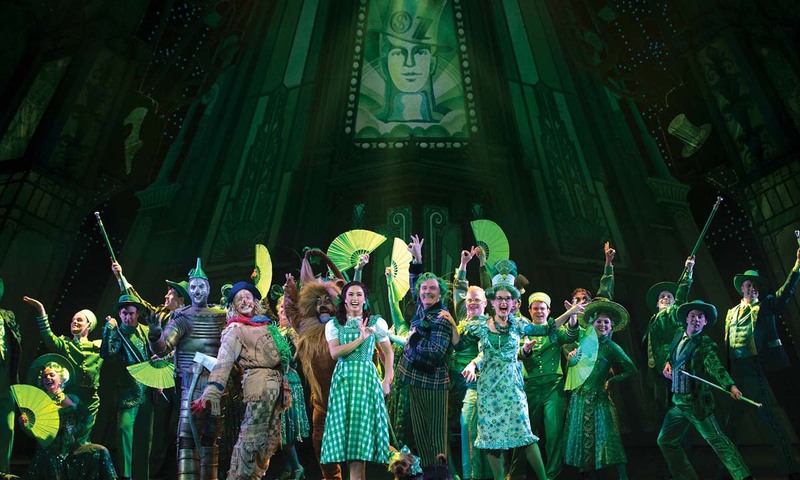 The Wizard of Oz is playing at the Festival Theatre until April 29.